Many people don't know the difference between Google's search box and the browser's address bar. This confusion is accentuated by the fact that the address bar is also a search box in some cases and Google, like most search engines, steal the focus from the address bar. So people type URLs in the search box. Google changed the way it treats those queries last year: instead of showing information about a URL, it returns standard search results and the top result should be the page that corresponds to your query. This is a great way to avoid typosquatting sites, like flicker.com or twiter.com. But what happens when Google doesn't find a page from a site included in the index? Until recently, it returned the standard "Your search did not match any documents." Now it returns more helpful information: results from websites with similar addresses, suggestions for queries and a way to identify the page by restricting the search to the domain/subdomain from my initial query. I think this is way cool :). Thanks for posting about it. 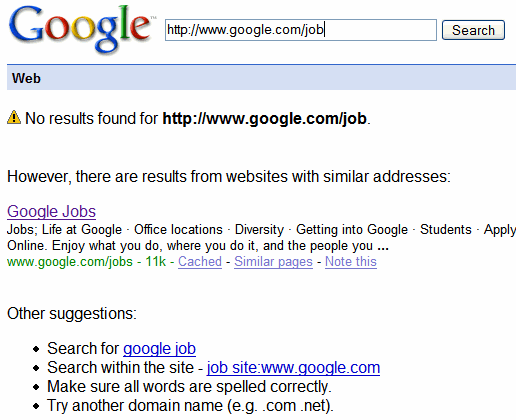 Too bad it ain't working the same with "www.google.com/job" (no http:// in front). OpenDNS does a similar thing. When you mistype a URL, it shows Google search results for the URL. Details here. This is so obnoxious. Any idea how to prevent this behavior? ok the idea is good and can help those if they are looking for similar sites.